Is dissident and disgraced theologian Hans Küng calling Pope Benedict a sedevacantist? Well, the Pope is reconciling with both. He’s bridging the gap with SSPX, and he’s welcoming orthodox Anglicans into the Church. He’s also done a lot with reconciling with the Lutherans and the Eastern Orthodox. Even at the local diocesan level, lots has been done. For example, about 2 years ago Bishop Burbidge of the Diocese of Raleigh met with the Superintendent of the Assemblies of God to discuss the gifts of the Holy Spirit. I am sure many other things like that are being done. So what exactly is the Pope doing EXCEPT uniting? Geez, I must come from a planet different than what Hans Kung comes from. Or maybe he wants uniting to be done with the pro-aborts, pro-gays of Bishopress Schori of the ECUSA, the commie pinkoes of the Unitarian Universalist Church, and other liberal monstrosities. Oh, man, he is so envious of his old theology classmate getting elected Pope that it just oozes out. Is it really that hard, to figure out that he should submit to the will of God and stop acting like such a maroon? And what a maroon. He got offered a deal already; the poor pope gave him a nice lunch right after his election. He could probably pick up the phone today and get a deal within a few hours. But he doesn’t want to repent and come to terms; he wants to be both pope and a feted dissenter. Hans, I’m laughing at the “superior” intellect. What, exactly, has Kuuuuuung done for unity? 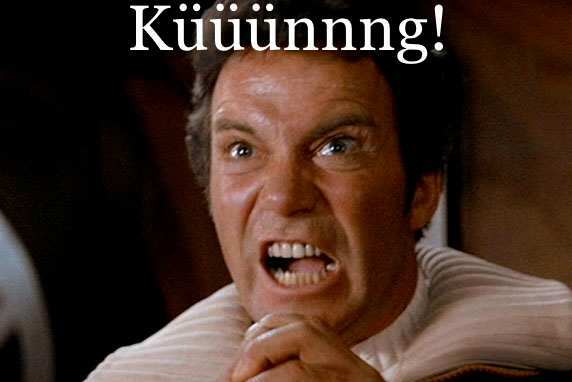 (I really don’t want to see Kuuuuuung in that Ricardo Montalban outfit – something tells me he couldn’t pull it off). Kung: Full publication of my unpublished manuscripts! Kung: [grabs Minion in anger] FULL PUBLICATION! DAMN YOU! Hans who? Does anyone outside of his own small club even know Kung is still alive and kicking? Back in the 70s his thick “On Being A Christian” was the toast of mainline Protestants, but since then, I am unaware of anything he has written making a splash. I don’t see why he his carping now should gain him any notice. Beter to do his embarrassed former dissertation advisor Louis Bouyer a favor and just ignore him. Is that the caddish Catlick, HMV Tone Blair? Thank you, Donald McClarey for your clarification of Kung. He demands an IMPRIMATUR for his writing which may or may not deserve an IMPRIMATUR. It is good to see Kung’s humility. Thanks again. Paul W. Primavera: “Or maybe he wants uniting to be done with the pro-aborts, pro-gays of Bishopress Schori of the ECUSA, the commie pinkoes of the Unitarian Universalist Church, and other liberal monstrosities.” and other liberal monstrosities. bears repeating.